We had crossed from Austria into Italy earlier that day. Now, several hours later, a spectacular drive through the Alps was nearing its end. On both sides of us green rugged hills jutted upwards towards the blue sky. Perfectly lined up vineyards covered their steep slopes. A fast stream was flowing in the gorge below. All the while our little red car kept advancing carefully on the narrow road, following its many turns and curves. 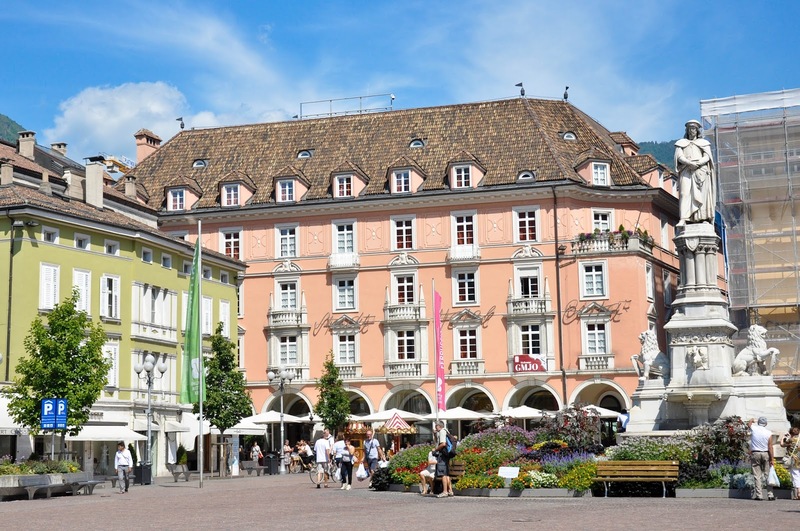 At the end of it lay Bolzano – the capital city of the Northern Italian province of South Tyrol and our stop for that night. Right before Bolzano a majestic castle suddenly came into view. Perched atop of a tall rock, the defensive walls seemed to grow out of it. I wasn’t even sure where the rock stopped and the castle began, it blended so well with its surroundings. A second later and our little red car drove into one of the many tunnels dotting the mountainous road and the vision of the castle disappeared as quickly as it had manifested itself only a moment before. We spent the night in Bolzano – the last night of our month and a half long trip which had taken us by car from Italy via France to England, then by plane from there to Bulgaria and once again back to England from where we had left by car to cross Belgium, Germany and Austria over eight days in order to return to our current hometown of Vicenza at the start of August. The day after we went to explore Bolzano’s city centre. We were eager for one last adventure. We wanted a memorable experience to round off our first big family road trip before driving back to Vicenza later that afternoon. 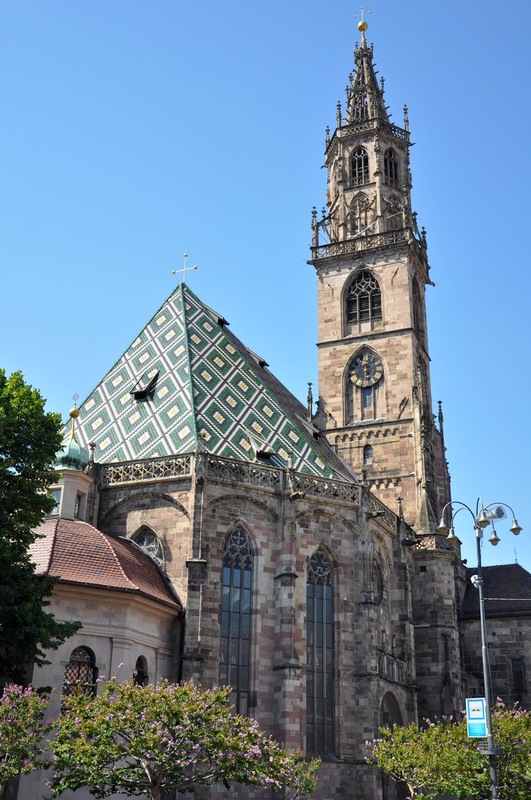 Bolzano was lit up by the hot summer sun and after a visit to its cathedral and the adjacent Cathedral Treasure museum we stood undecided in the middle of the square unsure what to do next. The colourful roof of the cathedral glistened under the blue sky. Lovely pink and green buildings surrounded the central square. The tables of the many charming cafes spilled all over the nearby pavements offering you a chance to enjoy the fabulous weather over a cup of coffee and something sweet. And just then we spotted it. A shuttle bus covered with images of the castle we had glimpsed from the road the day before. We made a snap decision and before we knew it, the shuttle was hurtling through the streets of Bolzano and ten minutes later it had delivered us at the bottom of a steep hill. 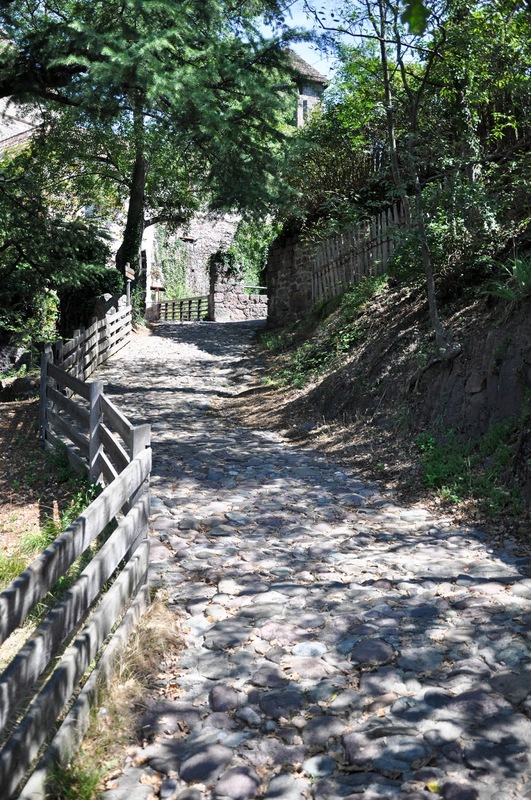 A wide cobbled path started from there and wound its way up. Scaling it in the oppressive summer heat was a strenuous exercise. It was all worth it though. As at the end of the path, the castle was waiting for us. Its name is Runkelstein or Castel Roncolo. 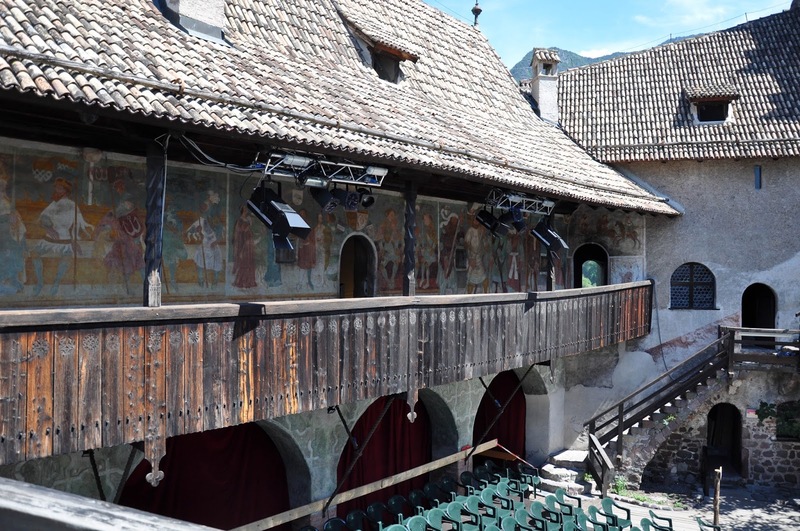 It depends on which language you prefer to speak – German or Italian – as in the bilingual South Tyrol both are official languages and even the province itself has two names – respectively Sudtirol and Alto Adige. 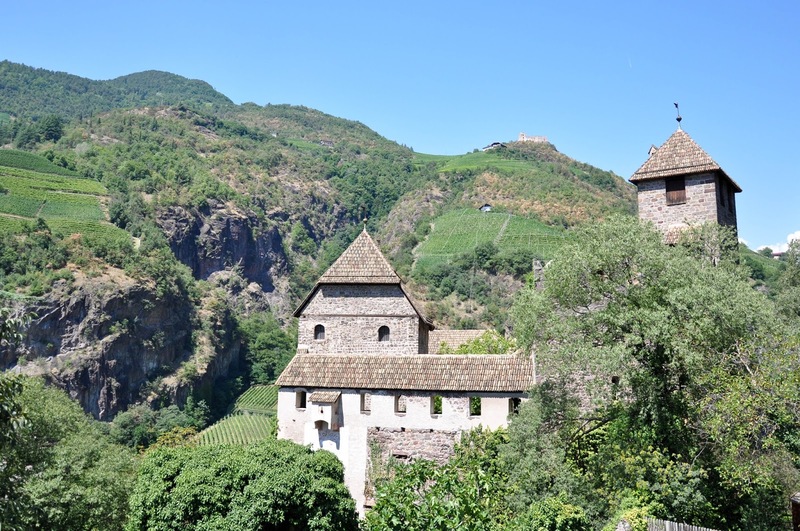 Built in 1237 and with a tumultuous history of sieges, destruction and rebuilding behind its back, we found Castel Roncolo peacefully enjoying its old age. The medieval buildings stood guard around a sunny courtyard. Steep irregular steps led from one floor to the next and then a parapet walkway along the crenelated defensive wall connected the Western Palace with the Summer House. It was a quiet, yet a lively place, with several visitors wandering around the various rooms or having lunch in the courtyard cafe. Tickets in hand we started our self-guided tour of Castel Roncolo. 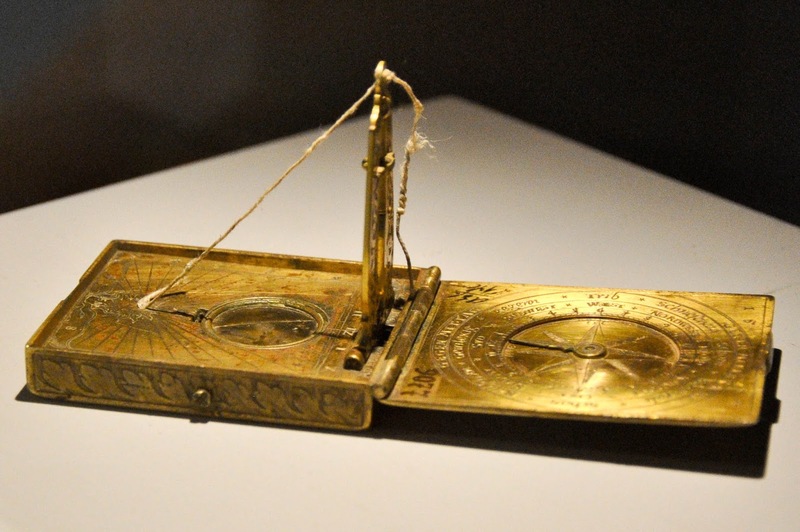 The most amazing thing about is that in 1385 it was bought by two wealthy merchants – the brothers Niklaus and Franz Vintler. For its time, this was quite unheard of, as only members of the aristocracy could own and reside in castles. 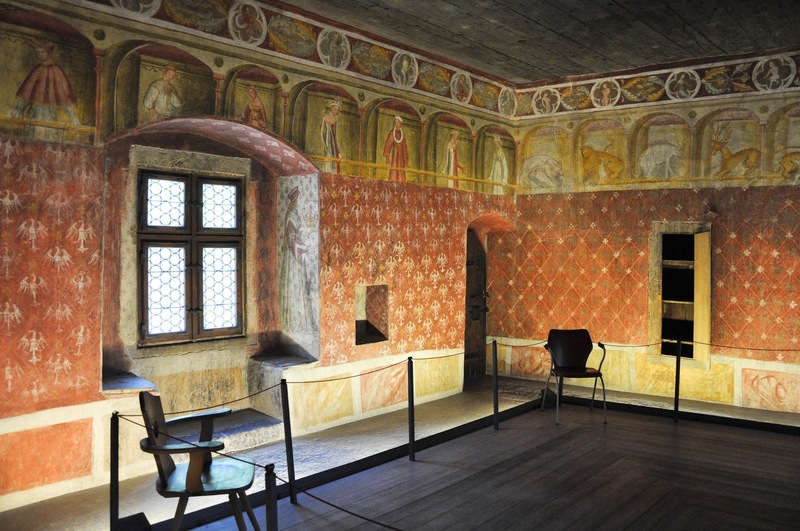 The two brothers restored and enlarged the Castel Roncolo, which had been abandoned after a siege a century before, and, most importantly, commissioned painters to cover the walls of its rooms with sumptuous frescoes, which can still be seen today. 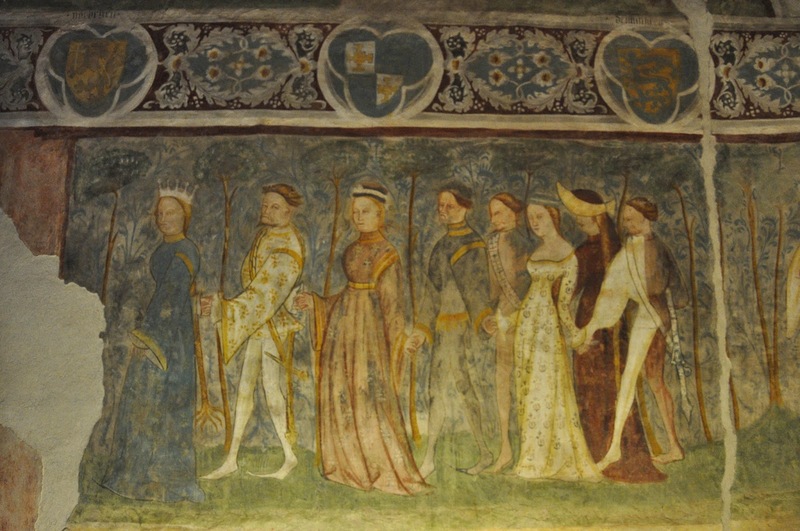 representations of court life in the Middle Ages with hunting, fishing and dancing scenes. myths and legends, more specifically the tragic story of Tristan and Isolde and of the Arthurian knight Garel. 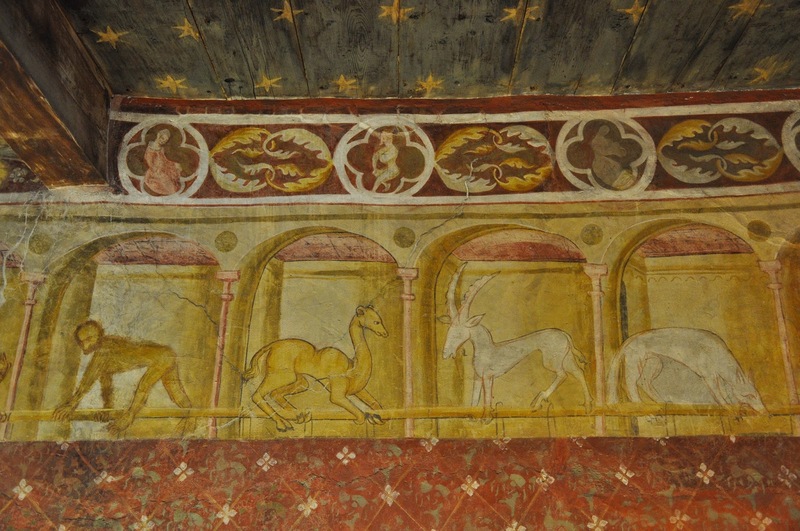 The frescoes have deeply suffered with the passage of time, but after several bouts of restoration, most recently between 1995 and 2000, they are still resplendent with their colourful palette and inspired scenes. My favourite depictions were the animals in the so called ‘Bathroom’. 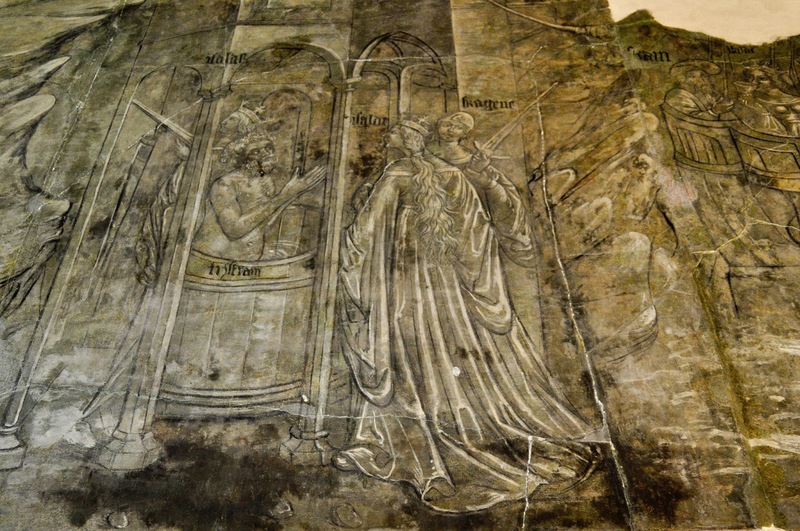 This was a large room on the second floor of the Western Palace, which, in fact, had never been used for taking baths, but owed its name to the series of naked men drawn on one of its walls. 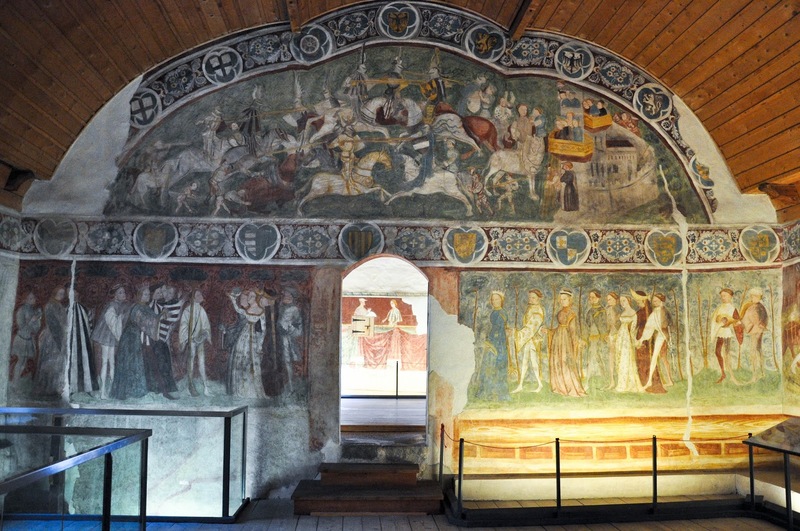 The whole room was covered with frescoes and its ceiling was blue with painted sun, moon and stars. Window alcoves looked over the nearby hills and I could imagine the court ladies of the day sitting there with needlework in hand whiling the long hours. 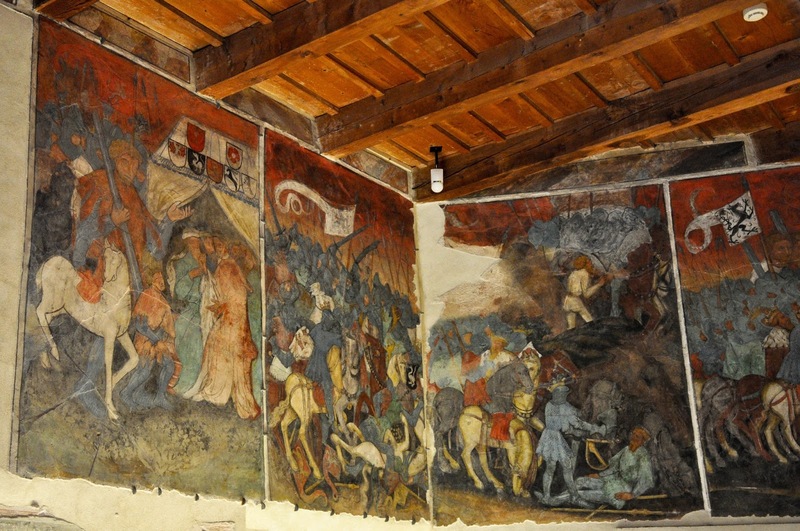 The Room of the Love Couples was right next door and its walls were covered with frescoes of knight jousts, which were very popular in the Middle Ages. Noble opponents on horseback would try to poke each other with long wooden sticks for the amusement of the ladies of the court. Apparently, such tournaments were only a type of sport and not real fights, as the aim was not to maim or kill the other, yet a lot of accidents happened leading to the jousts being forbidden over and over again to no avail, such was their popularity. 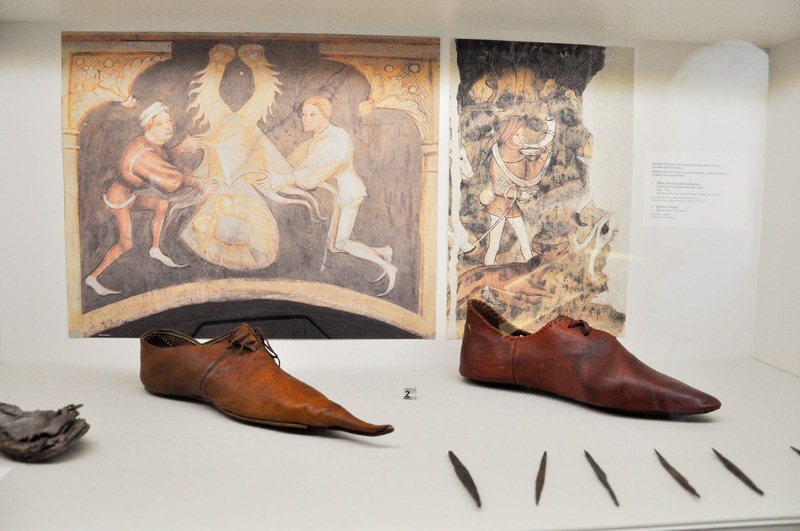 Small exhibition cases were dotted around the rooms showcasing objects of daily life as it were in the Middle Ages. I was particularly taken with the shoes. With their pointed toes they were a proof that, indeed, fashion repeats itself. 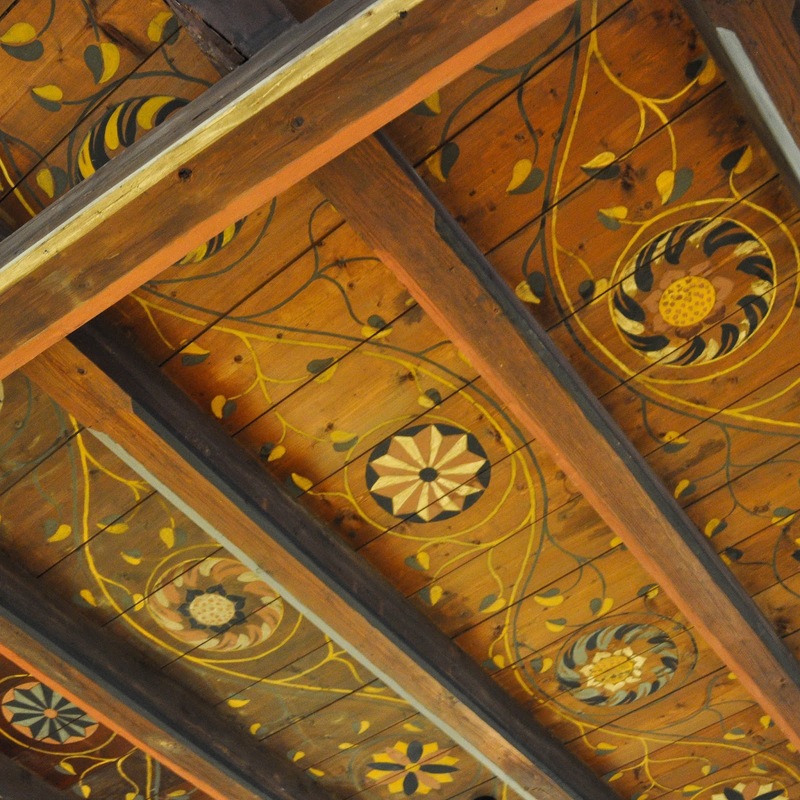 We crossed the parapet walkway over to the Summer House with its splendid veranda, completely covered with colourful frescoes. In the small courtyard below us, rows and rows of chairs had been set up for the many concerts and performances held there. 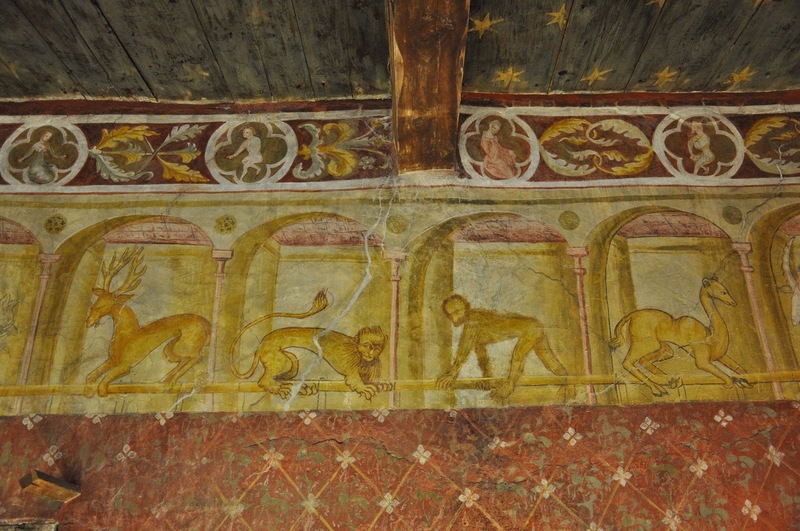 Although still splendid, the frescoes in the Summer House have felt somehow more acutely the passage of time. Story has it that in 1868 one of the walls there collapsed after the construction of a new road required a nearby bedrock to be blasted. 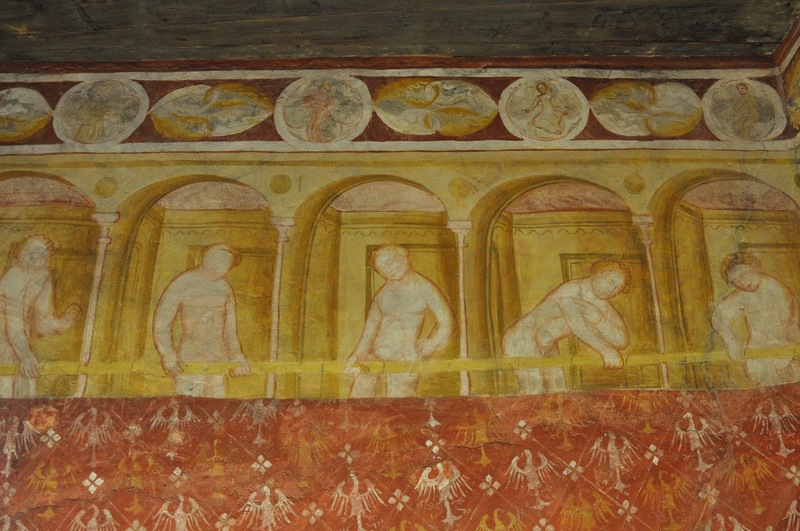 Thankfully, most of the frescoes were saved and then re-applied to the newly built wall. Yet, whole patches of the walls in the Summer House are nowadays completely bare. 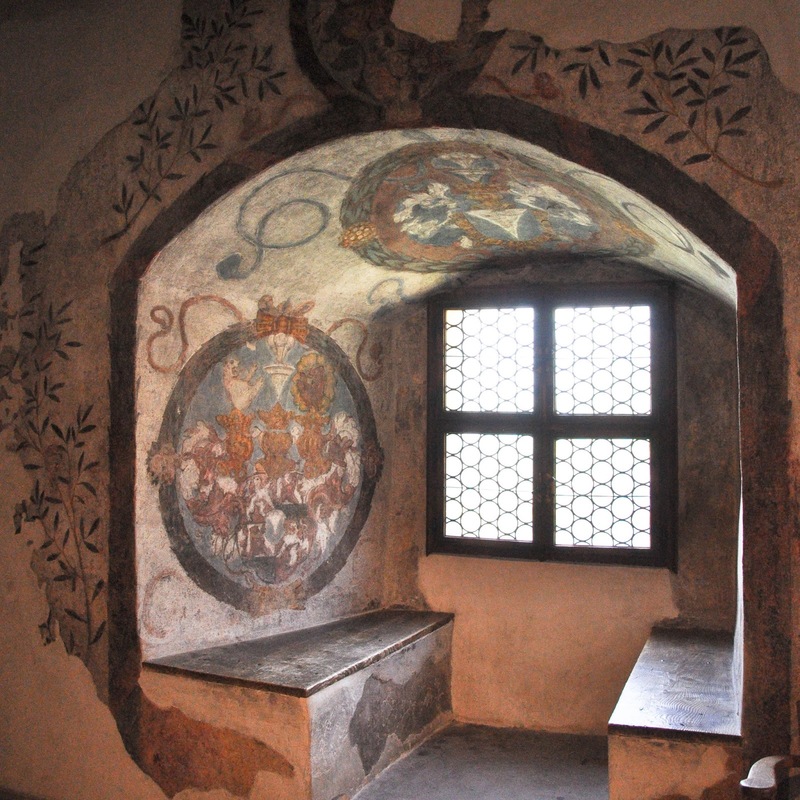 What made an impression on me in the Summer House, apart from its fantastical frescoes, was the shape of the rooms. They were long and narrow, curving at their end. The ceilings were high and the windows seemed small and sparse, too. I would imagine this was so as to keep the oppressive summer heat out. 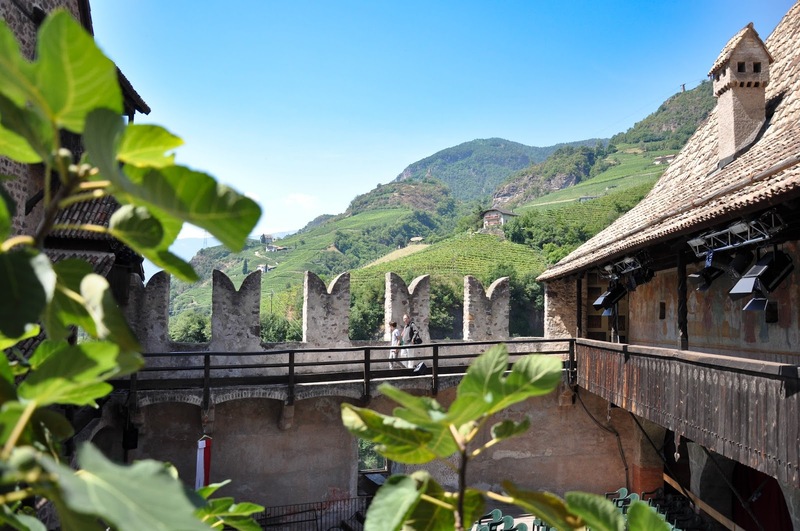 In fact, even though the Castel Roncolo was basking in the close to 40 degrees Celsius heat of early August, the rooms of the Summer House were cool and lovely to spend time in. 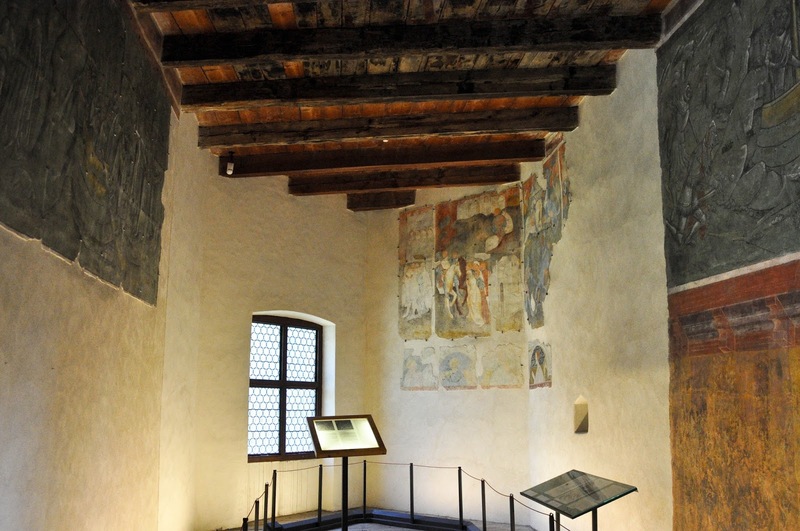 From there, we progressed to the final portion of Castel Roncolo’s buildings where an exhibition was laid out. 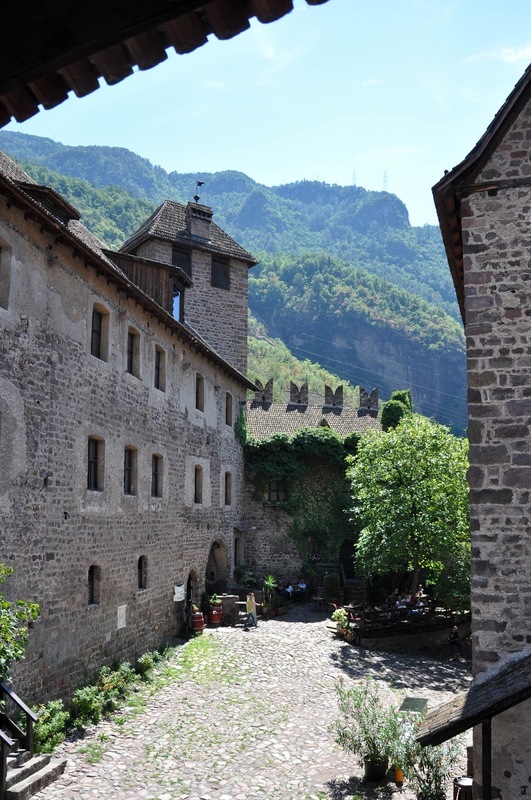 Several artifacts explored the past of the castle and the history of Via del Brennero. 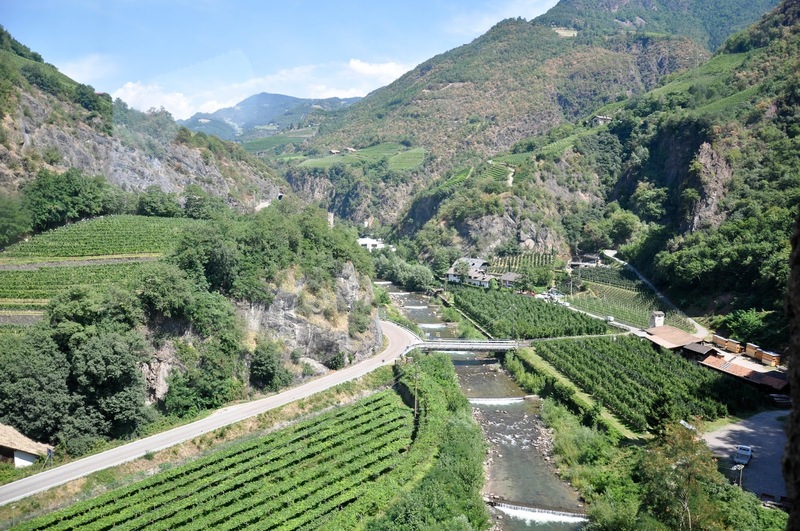 Brenner is a mountain pass through the Alps between Austria and Italy. It has been used since the most recent Ice Age and in the 2nd century AD a Roman road was built there. 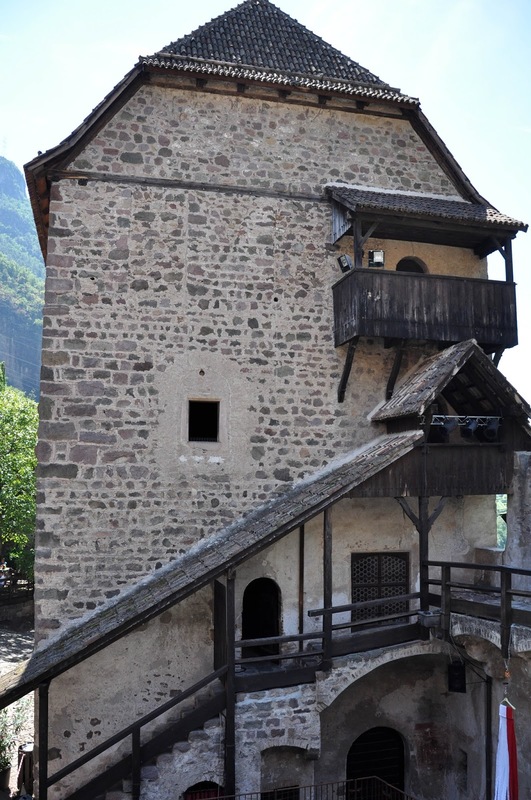 During the Middle Ages, the pass connected the Kingdom of Germany with Verona and was heavily used by pilgrims, merchants, and vagrants. With our curiosity about the history of Castel Roncolo sated, we gathered round a table in the courtyard ready to enjoy lunch. Bruschette with olive oil and fresh tomatoes and homemade pasta with freshly picked mushrooms were rounded off with generous portions of gelato. It was a fitting end to our road trip. One last adventure to keep us warm and fuzzy inside and to inspire us to already start planning how we are going to spend the summer of 2016.